Homemade and oh! so! good! Martini's came of age in the Roaring 20s and re-surged in popularity after Prohibition failed around 1933. That climaxed in the 1950s and 60s (vodka martini - shaken, not stirred) But Prohibition caused more than a loss of joy, let alone tax revenue. Orange Bitters, like the gomme* syrup in the Pisco Punch were a necessity of the bar or cocktail cart. Prohibition caused the makers of these small products to go out of business and after Prohibition, more than a decade later, those who came of drinking age during that time had no reference to the old ways. Who was making these small goods? Prohibition prohibited them. After these makers went out of business, it took 70 years for companies to come into business to replace them. The history and mystery of the Martini became lost to time. Fortunately, Charles Baker's oddly amusing cookbook: The South American Gentleman's Companion, contains a (if not the) recipe for Orange Bitters for Martinis. 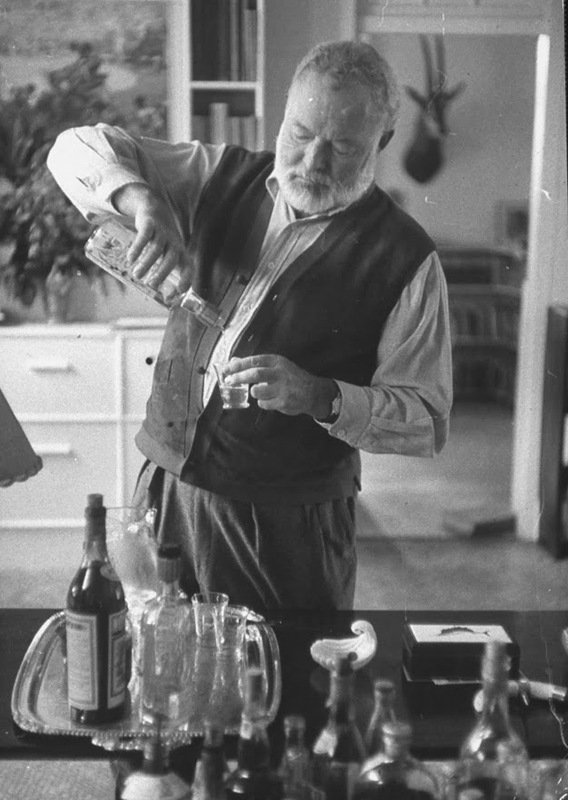 Baker was a friend of Ernest Hemingway. In fact, they were drinking buddies. So, even though I have no clear and convincing evidence that they used this recipe in their Martinis, I believe it is a reasonable assertion. I will give Baker's recipe as in his book and then I will give my take on what is wrong with it. I have made this recipe before. On that basis I amend Mr. Baker's. "in mason jar with sealing top put ½ lb chopped freshly-dried orange peel—yellow part only—and Seville or Bitter-Sweet orange peel is best. Add ½ dram coriander seed and ¼ dram each of caraway and cardamom seeds; then finally 3 cups [sic!] pure grain alcohol, now purchasable in your package store. Seal and let stand for 3 weeks, shaking every time you think of it. Pour off in a funnel wiht filter paper (a Chemex coffee filter is fine); 3 layers of outing flannel or a piece of felt cloth. Put in a clean 2 qt bottle and cork. Now put macerated peel and sees into a small saucepan; add 3½ cups cold water and fetch very slowly to a boil. Stir now and then and when it simmers, draw-off heat. Let cool, filter and add to the previous lot of spirits bitters. Now add 1 tbsp bar or Gomme* Syrup and mix-in thoroughly. then finally contribute 1½ tbsp or so of burned, caramelized sugar for a nice amber color. Let steep, and put through final filtering if any sediment. Keep on home-bar in quill or "squirter" top bottle, so a dash may be added as required when mixing drinks." I have made this recipe. However Mr. Baker got it. Whosoever he got it from gave him the nearly true recipe. And I say it like this, as the coriander, caraway and cardamom are in quantities too tiny to taste. And I've made it per his instructions. Next, the notion of "freshly-dried" is oxymoronic. Dried is good and dried a long time, better. Why? Because the Seville Orange, the ingredient for Orange Marmalade, improves with time. The flavor becomes more sophisticated. To sum up so far, the quantities of liquids are either out of proportion or the three herbs are. Also, in the recipe list he calls for 4 cups of alcohol, but only uses 3 in this Instructions. Confusing. I think the recipe would be in thus quantities for 4 cups of alcohol and 3½ cups of water (60 fluid ounces). If you can find fresh Seville oranges, use them. No harm, no foul. Current prices for dried orange peel on eBay are through-the-roof. Imported from Belgium the peel is $10 (US) in early 2014. The prices of the herbs are inconsequential. Everclear (a brand name of ethyl alcohol) is $22 a "fifth" in 2014 prices and only 151 proof (about 75%). So it's not going to be easy to make this recipe at home, unless you are very diligent. I guess you could put the Everclear in your freezer overnight and decant the liquid (ethyl alcohol) from the solid ice. I have never done this. First chop the orange peel very fine, say ⅛" dice. Then add the peel and the bruised herb seeds and pour on alcohol, then stand in a sealed jar for 15 days, agitating every day, as you walk in and out of the kitchen. Pour off spirits through a paper coffee filter, and seal again. Take the seeds and peel, put them in a saucepan with 3½ cups of water. Bring to a simmer for 15 minutes. Cover. Remove from the heat and allow to come to room temperature. Strain through a coffee filter. Add to the alcohol, strain again if necessary. Put in caramel coloring to make an amber color. Add the Gomme syrup. Agitate to mix before using. *Gomme Syrup, see above at the Pisco link.